This includes a wide range of goods, works and services, including front-line direct services and indirect back-office support. We use a variety of contracts, from simple purchase orders to long-term contractual agreements. Some contracts are with a single provider, others are framework agreements with multiple suppliers. If you have any queries in relation to North Yorkshire County Council’s procurement and contract management service please contact - procurement@northyorks.gov.uk. We use YORtender to advertise tendering opportunities, manage the procurement process electronically and monitor contract performance. Registration is free, and you will start receiving email alerts on relevant projects as soon as you have completed the supplier registration and chosen your categories of interest. If you have any problems using YORtender you can email procontractsuppliers@proactis.com. Procurement and contract management has changed dramatically at the County Council in recent years. During this time the organisation has put in place the foundation stones for success, moving to a centralised category management based function. Alongside this, internal procurement regulations have been modernised and corporate governance has improved. Download the procurement and contract management structure (pdf / 256 KB). We use a category management approach, where related expenditure is grouped together, using data, to create a better understanding of our buying needs and of what supply chains have to offer. The categories are then managed through a continuous and systematic process to improve quality, savings and efficiency. The aim is to source more strategically, be more innovative and enable service managers and commissioners to get the most out of the market and supply chains. 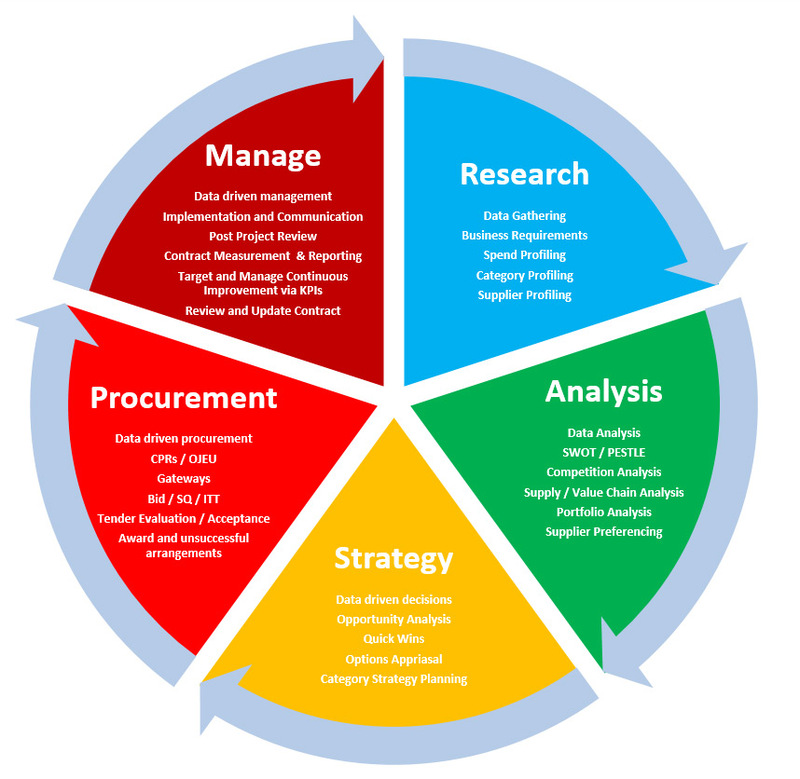 Data driven procurement is at the heart of our approach, and is summarised in our category management process. Download the category management process (pdf / 508 KB). Standard contract terms and conditions - goods and services for North Yorkshire County Council. In April 2016 we implemented a new purchasing and payment system. As a result of this change, we are now enforcing a 'no purchase order, no pay' policy. For procure to pay queries please email procure2payenquiries@northyorks.gov.uk. Small and medium sized businesses can request to be paid within ten days of us receiving their invoice. To apply for ten day payment terms please complete the application form for ten day payment terms (doc / 49 KB) and email it to exchequer@northyorks.gov.uk. We want to be open about the payments we've made and contracts we award to suppliers for goods and services. One of the ways we do this is by publishing information about our contract payments on our open data site. North Yorkshire County Council have a range of products and frameworks that can be used by other public sector organisations. If you’re looking for a scheme that will provide benefits for your employees, this framework has been designed to help you. The framework contract is for the provision of a management information system and a financial accounting system for schools and academies. Lot one is in respect of the management information system for all primary schools and academies nationally. Lot three is for a financial accounting system for local authority maintained primary schools nationally. Lot four is for a financial accounting system for local authority maintained secondary schools nationally. Lot five is for a financial accounting system for use by primary academies and multi academy trusts nationally. Lot six is for a financial accounting system for use by secondary academies and multi academy trusts nationally. This framework agreement is available to all local authorities throughout England and Wales. The framework is also available to all schools throughout England and Wales. These schools include local authority maintained, free schools, faith schools, pupil referral units, special schools, academies and multi academy trusts. Open the management information system / financial accounting system framework. We have implemented a single supplier framework for an accounts payable audit solution to work alongside the organisations existing accounting system. The software provides in-depth analysis of the public sector organisations finances in order to identify potential financial errors. The single supplier framework is available to all public sector organisations within the United Kingdom, including but not limited to central government departments and their arm length bodies and agencies, non department public bodies, NHS bodies and local authorities. This will be a four year single supplier framework with the ability to create nine year call off contracts from. The attached buyers guide provides interested parties the details around the framework, if you wish to proceed download and complete schedule B of the buyers guide (docx / 173 KB). “Supplier” means the supplier of the Goods and / or Services. 2. Subject always to Condition 3 below, these Conditions apply to all Orders for the purchase of Goods and / or Services by the Council from the Supplier. All other terms and conditions are excluded including any terms and conditions which the Supplier may attempt to apply under any sales offer or other documents. Delivery of Goods and / or performance of the Services by the Supplier to the Council shall be deemed to be conclusive evidence of the Supplier’s acceptance of these Conditions. 3. If the Supplier has entered into a separate agreement (“Agreement”) with the Council in relation to the purchase of Goods and / or Services at the Council’s request, then in the event of any conflict or inconsistency between these Conditions and the Agreement, the Agreement shall prevail. 4. No variation of these Conditions shall be effective unless agreed in writing between the Council and the Supplier. 5. English law applies to these Conditions and the Order. 6. A person who is not a party to this Order has no right under the Contracts (Rights of Third Parties) Act 1999 to enforce or to enjoy the benefit of any term of this Order. 7.1 Goods must be of the type and quality specified in the Order, and where relevant must comply with samples previously approved by the Council. 7.2 Goods shall be supplied in such quantities, at such times and in such a manner as the Council may direct. Goods shall be delivered at the Supplier’s risk to the address specified in the Order and shall be free from charges for carriage and packaging except where the Council agrees to pay such charges in the Order. The Supplier shall be responsible for the off-loading of Goods on delivery. 7.3 Property and risk in the Goods shall pass to the Council on delivery except where payment has already been made, when property in the Goods shall pass on payment. 7.4 The Supplier shall provide a delivery note quoting the Order number and giving details of the Goods delivered. The Council’s Order number must also be quoted on the invoice. 7.5 If the Goods delivered are not of the specified quality, quantity or type or if they do not comply with any sample previously supplied then the Council can either refuse to receive the Goods at all or can reject all or part of them. 7.6 If any Goods rejected by the Council are not removed by the Supplier within seven days from the notice, the Council may remove the Goods at the Supplier’s cost. Rejection may be for quality reasons or other valid grounds. 7.7 The Supplier warrants to the Council that the Goods will be of satisfactory quality (within the meaning of the Sale of Goods Act 1979) and fit for any purpose stated by the Supplier or made known to the Council at the time the Order is placed; the Goods will be free from defects in design, material and workmanship; the Goods will correspond with any relevant specified sample and will comply with all statutory requirements and regulations relating to the sale of goods. 7.8 If the Supplier does not deliver the Goods within the time specified in the Order the Council may cancel the Order. 7.9 The Council shall not be liable for any damage to or deterioration of any rejected Goods whilst in its possession. 7.10 The Supplier must comply with every relevant legal requirement (including EU and UK standards) relating to the manufacture, packaging and delivery of the Goods. 7.11 The Council’s rights in these Conditions supplement any warranty or guarantee offered by the Supplier. The Council will have the right to require the Supplier to remedy defects in the Goods (by repair or replacement) if within six months of delivery, the Goods become defective because of poor design or workmanship, use of faulty materials or other relevant reason. 8.1 The Services shall be provided in accordance with the Order and any specification. 8.2 The Services shall be provided to such standards, at such times and in such a manner as the Council may direct and with all the skill, care and diligence to be expected of a competent provider of services of a similar kind to the Service. 8.3 The Supplier shall at all times make available sufficient personnel and all other resources as are required for the successful and timely completion of the Services. 8.4 The Services shall at all times be provided by appropriately supervised, experienced, qualified, trained and competent personnel. 8.5 The Council shall have the right to decide whether any person is to be admitted to or is to be removed from the Council’s premises or is not to become involved in or is to be removed from involvement in the performance of the Services. 8.6 The Supplier shall carry out all necessary checks with the Disclosure and Barring Service on all staff employed or (if any) volunteers engaged to provide or supervise the provision of the Service if this is a statutory requirement. 9.1 Where a price is specified in the Order the price actually chargeable must not exceed it. 9.2 Undisputed invoices shall be paid by the Council within 30 days of receipt. 9.3 The Council may set off against the price any amount due from the Supplier under this or any other Order. 9.4 The Council reserves the right to vary its invoicing policy at any time and to require electronic invoices to be directly submitted by the Supplier. Any expenses of the Supplier involved in the submission of electronic invoices shall be met by the Supplier. 9.5 Except where otherwise agreed by the Council, the invoice will be paid by BACS and the remittance advice sent by email or fax. The Supplier shall provide details of its bank account and email address or fax number to the Council no later than the time of submitting the invoice relating to this Order. 10.1 The Supplier shall indemnify the Council against all losses, claims and costs arising from injury (including death), loss of or damage to property real or personal arising out of the act or default of the Supplier, its servants, agents or sub-contractors in connection with the Order. 10.2 The Supplier shall fully indemnify the Council against any expenses arising from any alleged or actual infringement of any proprietary right including but (not limited to) patents, trademarks, copyrights, intellectual or any of the rights arising from the Order. 10.3 The Supplier shall maintain satisfactory insurance cover with a reputable insurer in respect of all liabilities, both statutory and contractual, arising from the Order, to a minimum of £5m in respect of any one incident or such higher figure as the Council may specify. The Supplier shall produce evidence of such insurance and payment of the current premium to the Council on request. 10.4 The Council, its employees, agents or associated companies shall in no circumstances whatsoever be liable for any loss of profits or indirect or consequential loss howsoever arising from the Order. The Council may cancel the Order immediately if the Supplier becomes bankrupt, has a receiver appointed, goes into liquidation or if the Supplier is guilty of any offence under the Bribery Act 2010. The Supplier shall not assign or sub-contract the Order (in whole or in part) without the Council’s agreement but no consent is necessary for sub-contracting the delivery of the Goods. 13.1 The Supplier shall comply with all relevant anti-discrimination legislation, including but not limited to, the Equality Act 2010. The Supplier shall adhere to the Council’s Equal Opportunities Policy at all times when working with the Council. 13.2 The Supplier shall, and shall ensure that its agents, employees and sub-contractors shall, in performing its obligations under these Conditions, comply in all respects with the Data Protection Legislation and all subsequent and supporting legislation made pursuant thereto and will indemnify the Council against all actions costs expenses claims proceedings and demands which may be brought or made against the Council for breach of statutory duty under the Data Protection Legislation which arises from the use disclosure or transfer of Personal Data by the Supplier and its agents, employees and / or sub-contractors. 13.3 The Supplier shall, and shall ensure that its agents, employees and sub-contractors shall, not do or permit anything to be done which might jeopardise or contravene the Council’s compliance with the Data Protection Legislation. 13.4.2 becomes aware of a data security breach. 13.5 The Supplier shall allow for audits of its data processing activity and premises by the Council or the Council’s designated auditor and authorised representatives and make available to the Council all information necessary to demonstrate compliance with its obligations under this Contract and the Data Protection Legislation. 13.6 The Council is under a statutory duty which may require the release of information under the Freedom of Information Act 2000 (“FOIA”) and or the Environmental Information Regulations 2004 (“EIR”). Such information may include matters relating to or arising out of or under this Order. The Council shall be entitled to disclose such information in the event that it receives a request to do so and the Supplier shall assist and cooperate with the Council (at the Supplier’s expense) to enable the Council to comply with any information disclosure requirements. The Council will not usually disclose information which is subject to an exemption under the FOIA or the EIR however the Supplier acknowledges that the final decision whether to disclose such information will rest with the Council and not with the Supplier. Nothing contained in this Order or any documents or negotiations relating to this Order shall prevent the Council from disclosing any information which (in the Council’s reasonable opinion or in accordance with any recommendation, notice or decision of a competent authority) it is required to disclose under the FOIA or the EIR. The Supplier shall indemnify the Council against all claims, demands, actions, costs, proceedings and liabilities that the Council directly incurs due to the Supplier’s or any sub-contractor's breach of this Condition 13.6 or any part of it. 13.7 The Supplier shall comply with the requirements of the Health and Safety at Work Act 1974 so far as they apply to the provision of the Service and throughout the Contract Period the Supplier shall have in place a health and safety policy which complies with all statutory requirements. You can also download these standard purchase order terms and conditions here (pdf / 185 KB).